Marvel is excited to announce the release of an oversized dose of a galaxy far, far, away – Star Wars comics are coming to Marvel’s prestigious Epic Collection format – STAR WARS LEGENDS EPIC COLLECTION: THE EMPIRE VOL. 1 TPB. Let the dark times begin! 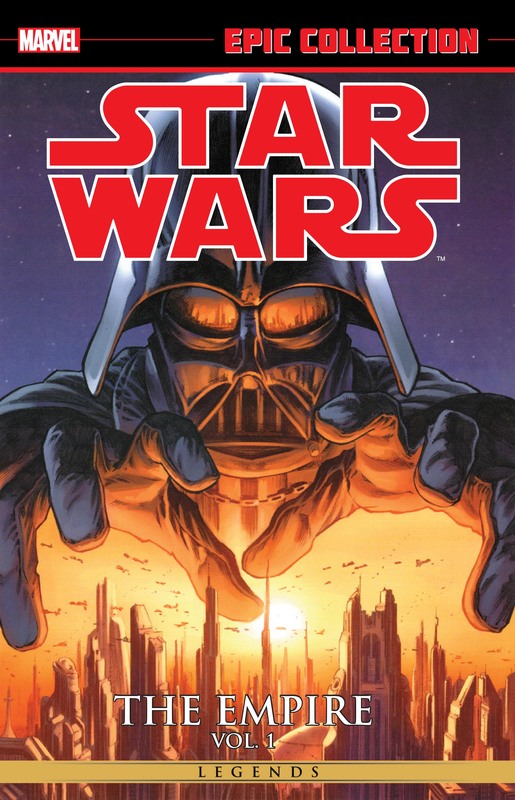 Marvel welcomes Star Wars to the Epic Collection program, with this first volume of a series focusing on the years that follow Star Wars: Episode III — Revenge of the Sith! After the end of the Clone Wars, the Republic has fallen and Palpatine exerts his ruthless grip on his new Galactic Empire. Now, the few Jedi that remain must decide whether to hold true to their faith, or abandon it completely in the face of a brutal purge — one carried out by the new Dark Lord of the Sith. Rise, Darth Vader! STAR WARS LEGENDS EPIC COLLECTION: THE EMPIRE VOL. 1 TPB. will offer a new way for fans to collect and read iconic Star Wars stories across the past 35 years of published titles. These oversized, self-contained color collections will bring the adventures of the Rebellion, the Galactic Empire and more to the masses with exciting new Epic Collections. STAR WARS LEGENDS EPIC COLLECTION: THE EMPIRE VOL. 1 TPB. © 2014 Lucasfilm Ltd. & TM. Used under authorization. All rights reserved.